One gets two different images by running the program twice. Because the program uses random numbers for the placement and color of each object, the second run will produce an image which differs in those features controlled by random numbers -- because new random numbers are created with each re-run. The clouds, the position of the path and the people on it, and several other things were programmed to use random numbers and have changed from one image to another. 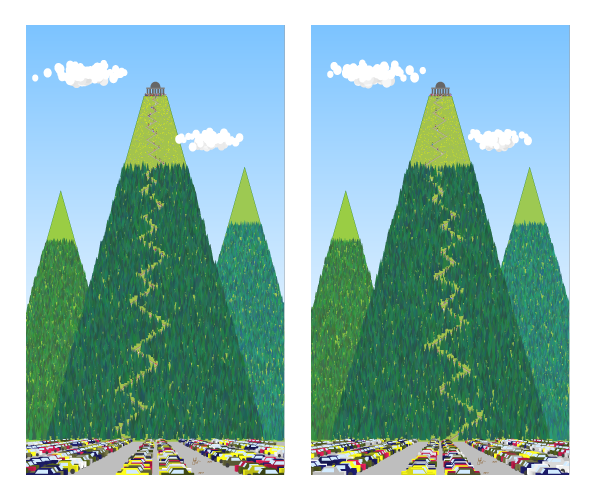 The height and shape of the mountain(s) was not programmed for the use of random numbers and remains the same. It is interesting that most people, when shown several versions of the same scene, will instinctively prefer one or another version.